It’s 8:50 on a Friday morning outside the Maliheh Free Clinic, at 415 E. 3900 South. Even though the weather is wet and drizzling, people have lined up for clinic services, which aren’t offered until 9 a.m. The clinic is one of only a handful in the state that serves uninsured Utahns who don’t qualify for Medicaid or Medicare. It operates fully on private donations and volunteer care. Patients must also show that their household income is below the 150th percentile of the Federal Poverty Level. For 57-year-old “David”—who asked that only his first name be published—that is a lifesaver. He’s come to get two prescriptions filled and his blood pressure checked. “It’s expensive stuff; out of pocket, this would cost $70-$100,” he says. David may have to wait outside in the rain to get treated by one of the volunteer doctors, but that’s better than new patients who may have to wait as long as six months for their first visit. The wait is not reserved just for patients of free clinics like the Maliheh clinic, however. Other low-income patients of federally funded clinics in Utah likewise struggle for access, and some clinics having stopped accepting new patients. Health advocates worry the strain will be critically increased in 2014 when President Barack Obama’s Patient Protection and Affordable Care Act will begin expanding health coverage to 32 million Americans. If health centers aren’t adequately funded to fill the void before Obama’s plan is implemented, it could mean a lot of people left out in the rain. When Jeanie Ashby, the current executive director of the Maliheh clinic, first joined the organization a year ago, the clinic was only open four days a week and had a wait list for new patients averaging four months. In 2010, the clinic served 16,000 clients, but even after expanding service to five days a week, the clinic’s wait list has lengthened to six months. “There just is more need than there is help out there,” Ashby says. 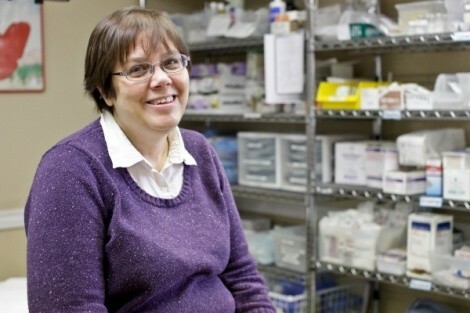 The clinic operates largely by volunteer clerks, physicians and doctors. Ashby says the clinic serves an indigent population that falls through the cracks of Medicaid and Medicare. She recalls a recent patient, a construction worker of 30 years who had lost his job and health insurance when the housing market collapsed, who had the attitude of, “I’m healthy, I can hold my breath for a month or two until I get a job,”—until he tore his rotator cuff playing basketball. With an injury that would keep him from working, the man also couldn’t afford temporary insurance and couldn’t qualify for Medicare or Medicaid, since he had no children living at his house. The Maliheh Clinic was able to treat him and then helped schedule him to receive shoulder surgery through Intermountain Healthcare’s charity care. He’s now working full time again. “The last time I saw him, I asked how he was doing, and he shot both arms straight in the air and said, ‘I’m doing great!’” Ashby recalls. Ashby knows that, ideally, her clinic’s clients could find service at regular hospitals, clinics and even community health centers once coverage is expanded to millions of Americans in 2014—when the Patient Protection and Affordability Act moves into its major phase of implementation—but she’s not holding her breath. Utah has 300,000 to 400,000 uninsured citizens, so there’s a lot of need—and that burden is left to free clinics like Maliheh and the state’s 11 federally qualified health centers. FQHC clinics receive federal grants to serve uninsured and indigent patients whose households are at least 200 percent below the Federal Poverty Level. The patients pay for service, unlike free clinics, but do so on a sliding scale. Part of the 2008 stimulus package included funding to invest in community health centers, but that funding is now in jeopardy. In 2008, Pruhs says community health centers were allotted funding from the American Recovery and Reinvestment Act as one-time money “given to health centers to open doors a little wider to individuals who lost jobs and lost insurance due to the recession,” Pruhs says. “In our state, that was about 10,000 patients.” With the passage of health-care reform in 2010, a trust fund was developed that was meant to pay dividends to community health centers so they would be able to grow and expand to create medical “homes” for people before 2014 to essentially strengthen the health-care safety net. Now, in 2011, Pruhs says his organization’s 11 health centers look after 115,000 patients in Utah, 60 percent of whom are uninsured. Along the Wasatch Front, that number is 70 percent uninsured—almost double the national average, Pruhs says. In the recent federal budget, however, the health center’s trust fund’s allotment of nearly $1 billion didn’t go to expanding service to keep up with demand, but instead went to backfill holes in their budget as a result of $600 million Congress cut from the program. Pruhs worries that costs will continue to get worse if the uninsured only seek medical care when it’s too late. That’s a reality that’s passed down onto his association’s clinics. For example, the Community Health Centers Incorporated, a chain of four health centers in Salt Lake County, serves 35,000 patients annually—but can no longer accept new patients unless they are children or pregnant women, says director Dexter Pearce.